BRIOVR is a cloud-based virtual reality (VR), augmented reality (AR) and 3D product visualization solution which allows users to create, publish, and share custom-built content experiences with their customers. The codeless, drag-and-drop platform allows users to customize their content experiences with animations, triggers, clickable links, and hotspots. 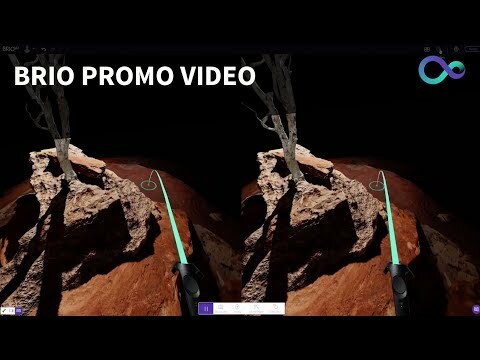 BRIOVR provides users with a selection of templates for their VR showroom, and users can also create their content from scratch and upload designs, 360 photos and videos, and 3D models. A comprehensive asset library provides users with free access to hundreds of 3D models and images. Users can also import their own existing assets from a range of programs such as AutoCAD, Blender, SketchUp, and others. BRIOVR supports mixed media in a range of formats, including PDF, MP4, JPEG and PNG. Users can publish and share their VR showrooms online, and view content through iOS, Android, and all major VR headsets. It's free, for starters, it has online training, and support is there to help you when you ask for assistance. It can sometimes freeze on you while designing. Pro: $9.99/month (billed monthly) or $8.33/month (billed annually). Enterprise: $49.99/month (billed annually) or $41.67/month (billed annually). Ultimate: contact SPINVR for pricing. • BRIOVR supports mixed media in a range of file formats, including MP4, PNG, JPEG, and PDF. • Users can create content experiences from scratch or utilize one of BRIOVR’s templates. • Animations, triggers, clickable links, and hotspots can be added to experiences to engage audiences. • The platform’s drag-and-drop functionality allows users to create custom virtual and augmented reality experiences without requiring any coding. • BRIOVR’s library provides users with access to hundreds of free 3D assets, and users can also upload their own 3D models and images from AutoCAD, Blender, and other systems. Below are some frequently asked questions for BRIOVR. Q. What type of pricing plans does BRIOVR offer? Q. Who are the typical users of BRIOVR? Q. What languages does BRIOVR support? Q. Does BRIOVR support mobile devices? Q. Does BRIOVR offer an API? No, BRIOVR does not have an API available. Q. What other apps does BRIOVR integrate with? Q. What level of support does BRIOVR offer?